We analyzed 961,668 eBay item titles to better understand how eBay’s search engine works. 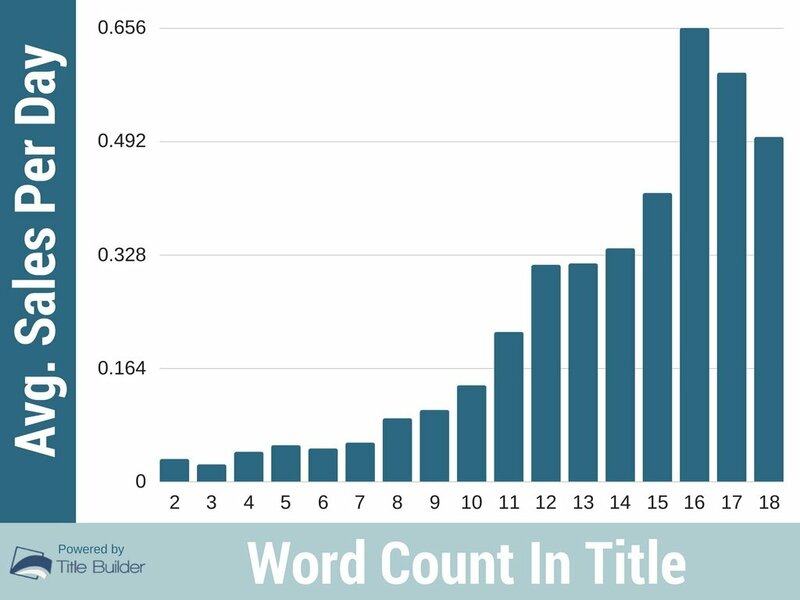 Specifically, we looked at the correlation between average sales per day and title length — like character count and word count per title. We also examined the use of Top Searched Keywords in the item title to better understand the influence of these keywords on sales. We learned a lot about eBay SEO. And I’m sure you will too. 1. Title Words Count appears to be an influential sales and ranking factor. 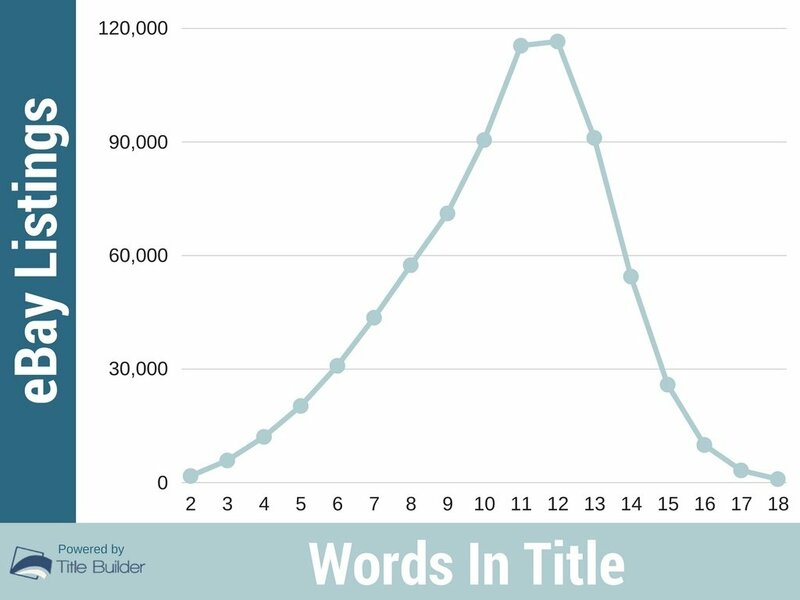 We found that a title with a count of 15-18 words strongly correlates with higher average sales per day. 2. Longer Item Titles significantly outperform shorter Item Titles. Titles with 75 characters or more generate more sales on average per day. 3. The number of Searched and Popular Keywords in item title is strongly tied to more successful sales. 4. There is a moderate negative correlation between having the item condition 'NEW' as a keyword in the title. 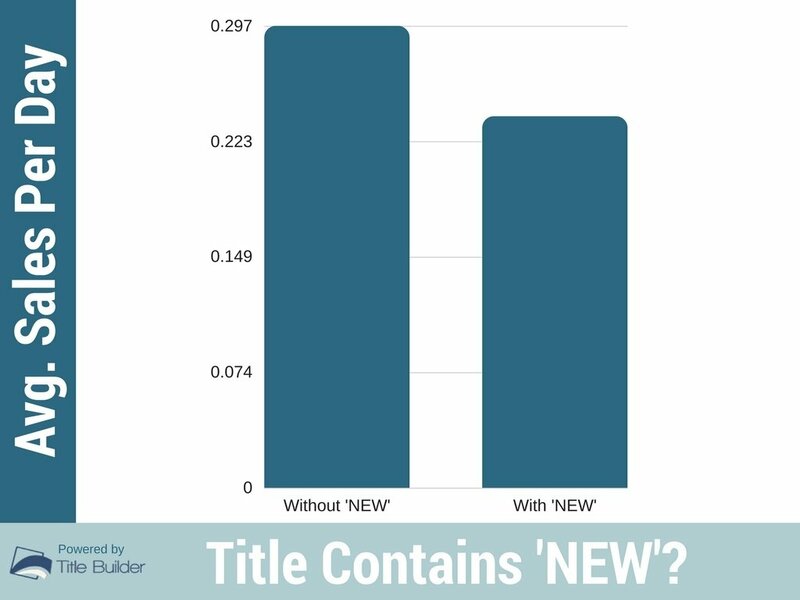 We saw that having the item condition 'NEW' in the title generates fewer sales on average. 5. 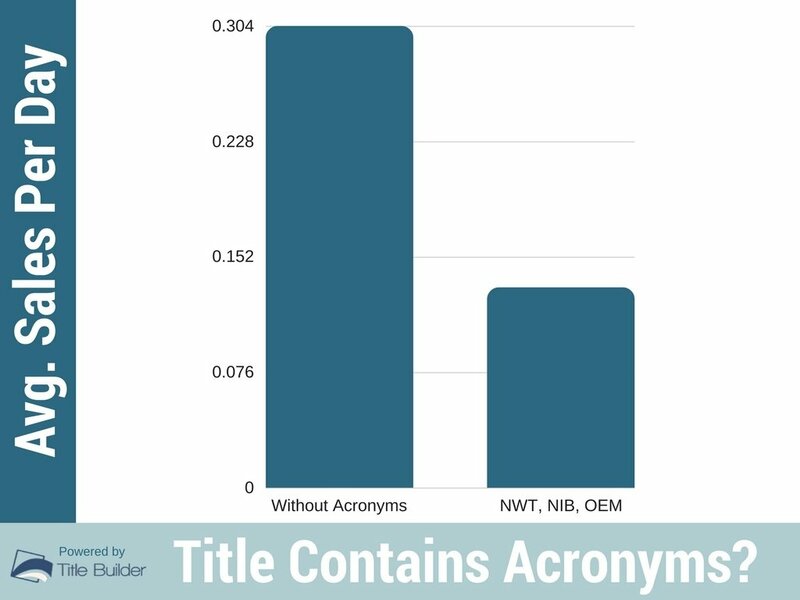 Item Titles with eBay Acronyms such as: NWT, NIB, OEM, etc., generates fewer sales on average per day. This may be because eBay buyers are not using these Acronyms when searching for a product. 6. 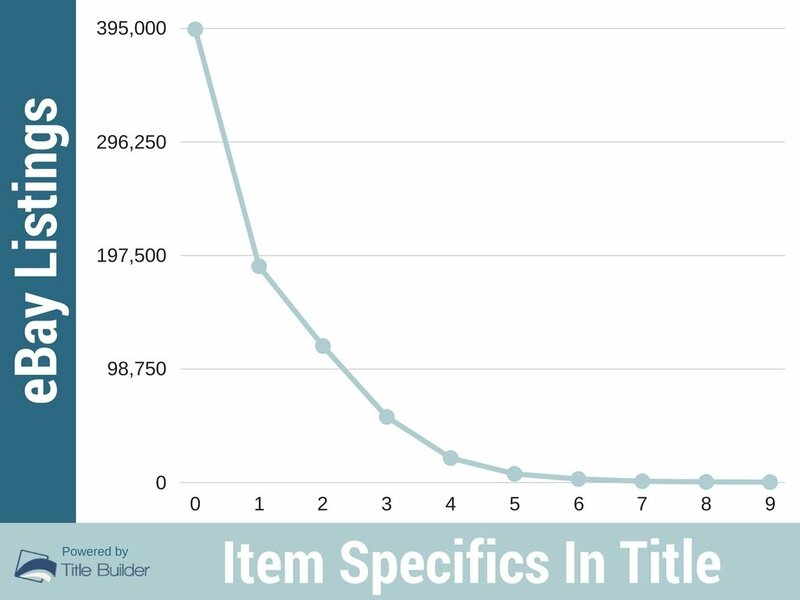 Titles that contain an exact match keyword in their Item Specifics appear to have more sales on average per day. This means that including Item Specifics in the title may improve your ranking and sales on eBay. 7. We found a small relationship between 'Brand' as a keyword in the item title and average sales per day. If you include the 'Brand' as Item Specific, you don't have to use it in the item title as well. 8. Subtitles have a reasonably strong correlation with average sales per day. Therefore, listings that contain Subtitle tend to have an advantage on eBay. 9. 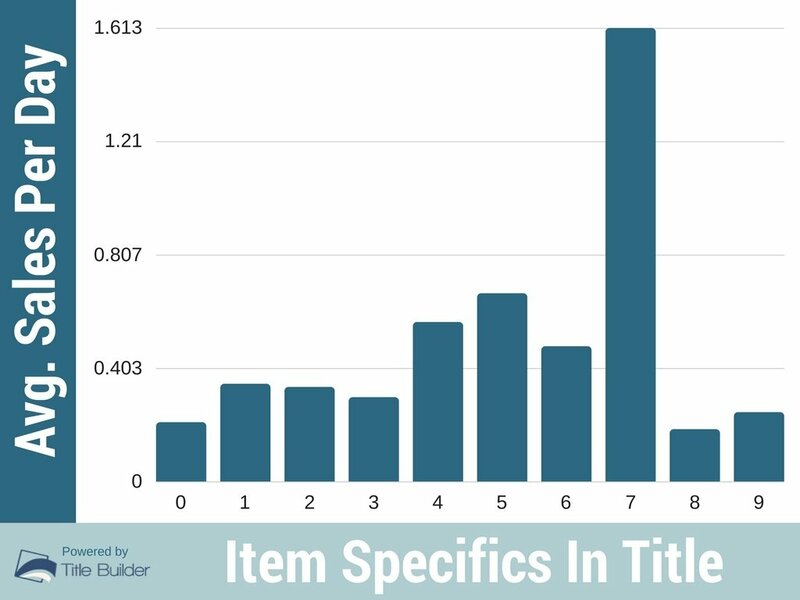 The average length of eBay first page item title (sorted by Best Match) is 64.4 characters and contains about 10.5 words. This means you get a 15.6 characters opportunity to add more keywords to your title and will outperform shorter titles as a result. eBay enables sellers to create item titles with up to 80 characters. Needless to say, most sellers use these 80 characters to include keywords that best describe their item. 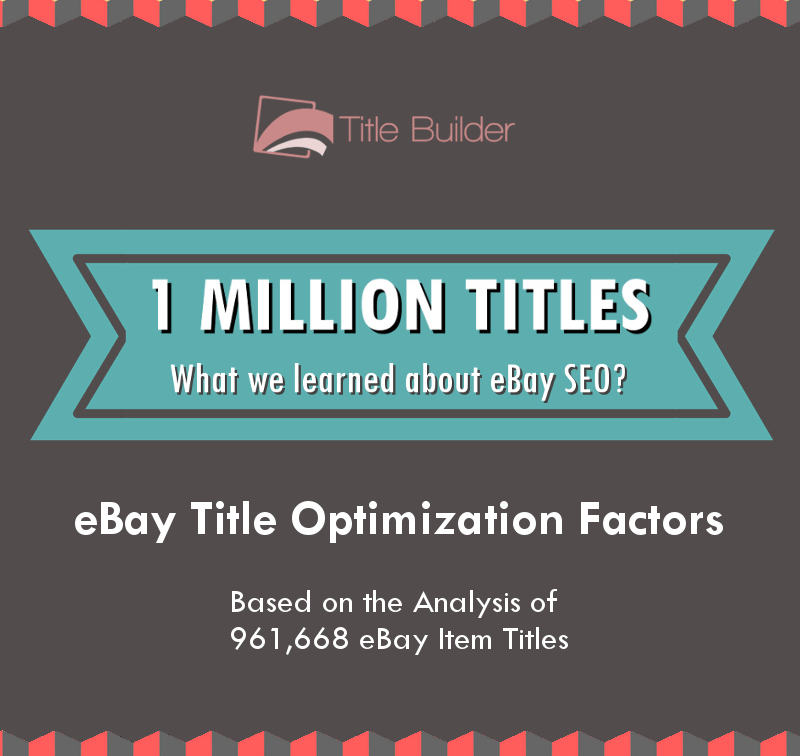 But does eBay Title Length actually generating more sales? 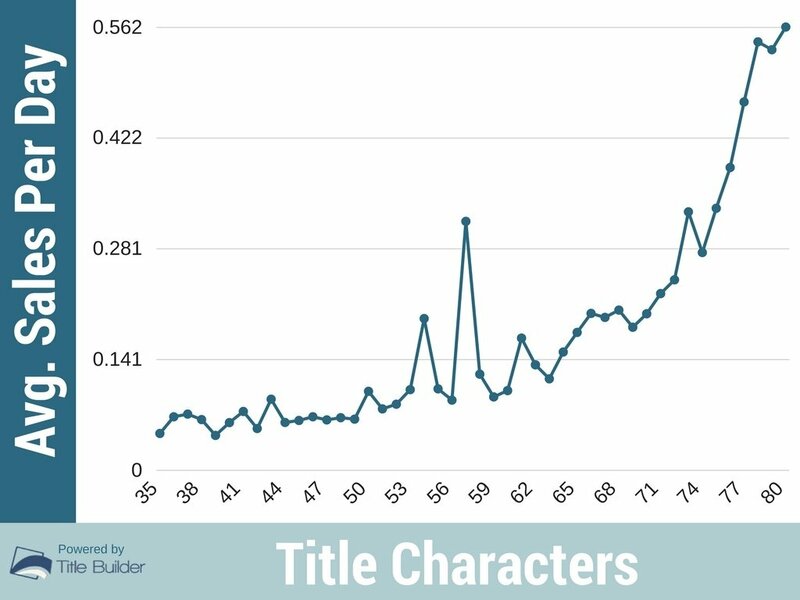 As you can see in the chart above, the more characters a title has, the more it tends to sell. Considering eBay's search engine uses keywords from item titles to match the user search query, this result isn't a big surprise. Key Takeaway: Titles with more characters tend to generate more sales on eBay than short titles. When it comes to generating eBay item titles – how many keywords should be placed in a title? We analyzed our data to find out. As a rule of thumb, the more keywords you have in your item title – the better it performs in terms of eBay average sales per day. Since most eBay buyers tend to search for items using keywords – you can increase your chance to become a highly ranked result on eBay if buyers searched for a keyword which is in your item title. Key Takeaway: Use as much relevant keywords as you can in your item title. You never know how your buyers will find you up. As shown in our previous blog post: How to Increase Your eBay Dropshipping Business’ Sales by 127% Doing This One Simple Step – we compared 2 item titles of the same product, from two different sellers. One seller used 9 keywords, copied from Amazon - while the other seller changed the item title into 12 keywords, using more general keywords that are popular and searched on eBay. 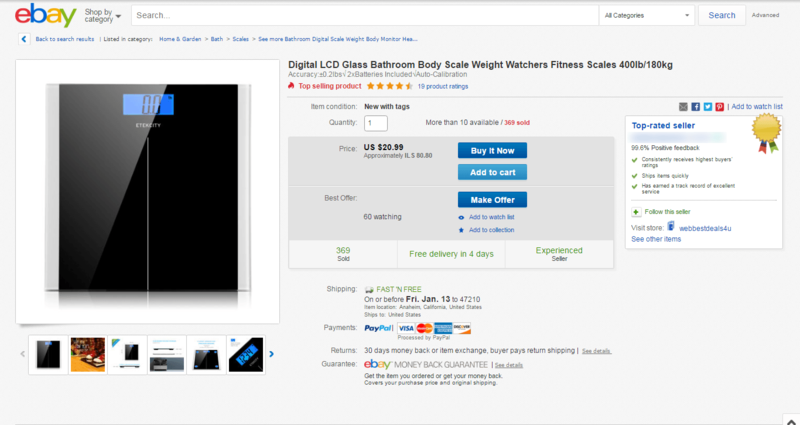 The difference between the long and short titles was not using the Brand Name (Etekcity) and Color (Black), but instead using Item Features (LCD Glass) and Purpose of Use (Fitness, Weight watchers). As seen in the pictures above, the result was more sales (at a higher price point…) of the item with more popular and searched keywords in its title. It appears that you need a 'Critical Mass' of popular keywords in your eBay item title. That's why you often see on eBay search results item titles that contain only keywords, without any grammar or sentence logic. Key Takeaway: Use as many searched and popular keywords in your eBay item title as possible. eBay's listing form allows the seller to choose the item condition as an option (New, Used, Refurbished, etc.) according to the selected eBay category. The chart above represents items with 'New' as their selected condition on eBay. We realized that item titles without the word "New" are related to items with slightly more sales on average per day. Key Takeaway: This may be counter-intuitive to a seller, but it seems that setting the item condition to "New" on eBay and adding an extra keyword instead of 'New' to the item title – can help you sell more on eBay. eBay limits the title to 80 characters, so many sellers use acronyms in their eBay listing titles such as NWT – New With Tags, NIB – New In Box, OEM - Original equipment manufacturer, and so on. But does the use of acronyms actually helps you sell more on eBay? As seen in the chart above, the average sales per day are higher for eBay items without acronyms such as NWT, NIB or OEM. 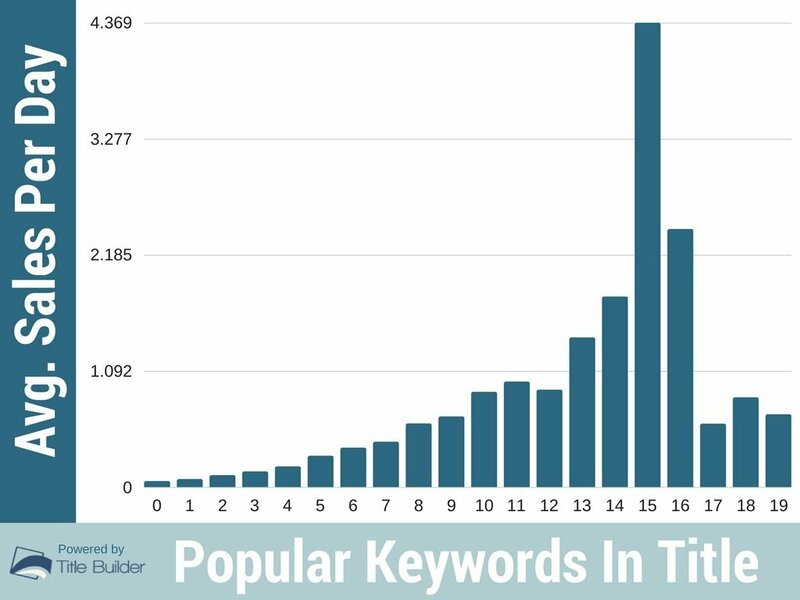 This may be due to the fact that not many eBay buyers (at least not as many as we think…) are actually using these acronyms as searched keywords. Key Takeaway: According to our research you may want to remove acronyms like NWT, NIB, and OEM from your eBay item title, and free up some space for other keywords in order to sell more on eBay. Product Material, Measurements, Color, Model, Country of manufacture, etc. Should a seller place these Item Specifics as keywords in the item title? Our study shows that eBay items with titles containing Item Specifics perform better than item titles without these keywords – and it is quite an easy task to do. Key Takeaway: “Item Specifics” title has a reasonably strong correlation with higher sales on average per day. 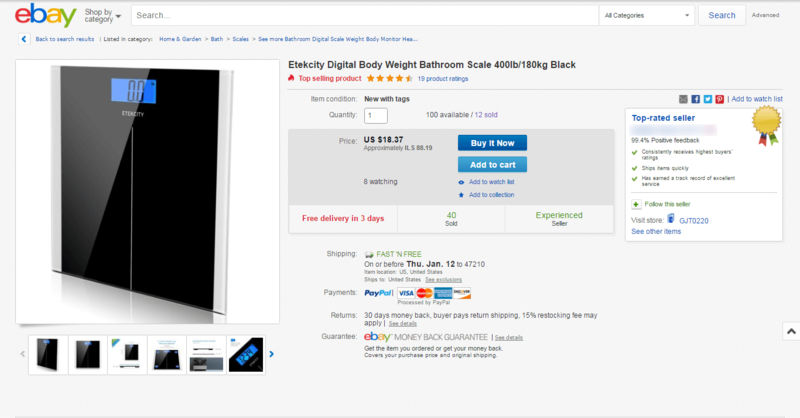 Many eBay sellers are selling items from 'Private Label' suppliers, and using their (unfamiliar) brand names, as keywords in the item title. 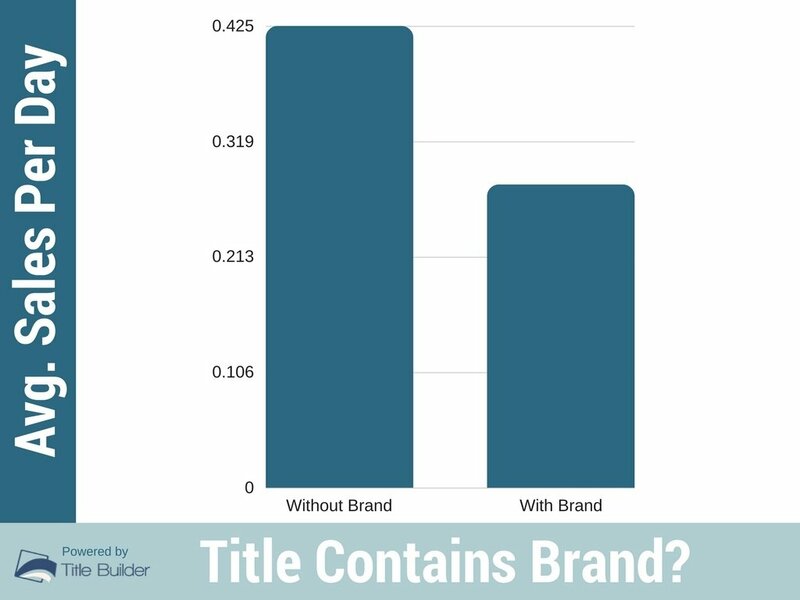 Our data supports this estimation by showing that sellers may use the 'Brand' name as an item specific instead of as a title keyword and will sell more items per day on average as a result. 'Brand' name can easily be removed from the item title and placed as an eBay item specific. Key Takeaway: Include your item 'Brand' name as an item specific and remove it from your title. It may help you increase your average sales per day. Using eBay’s subtitles costs money, but do they help you generate more money? According to our data – Yes, they do. eBay’s Subtitle field is limited to 55 characters - therefore containing even fewer keywords than the title. 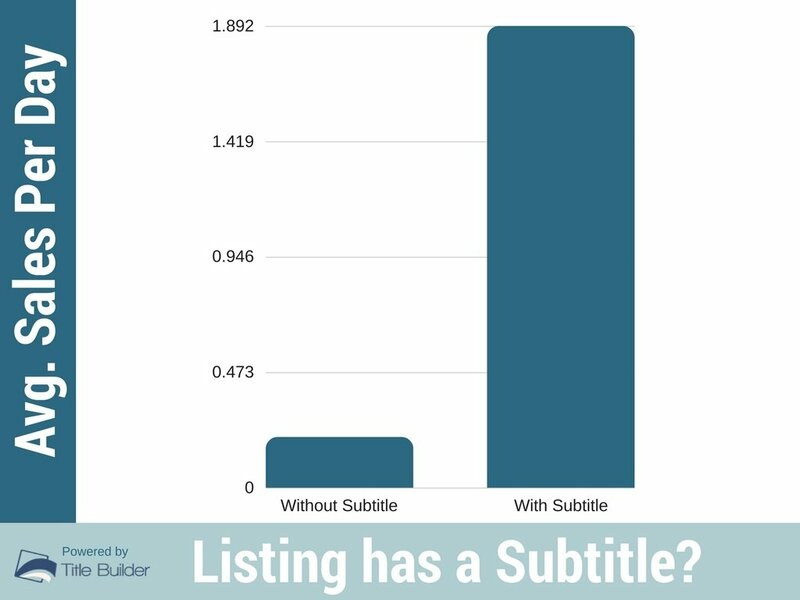 The strength of an eBay subtitle is the "Marketing" value it can add to your title by emphasizing the special opportunity in buying your product. We can't tell you what to write in your subtitle since its content is not being searched for by an eBay search engine – but according to our data, you should definitely use it in order to sell more on eBay. Key Takeaway: If the price is right for you, you should positively consider the use of item subtitle feature to generate more sales per day on average. 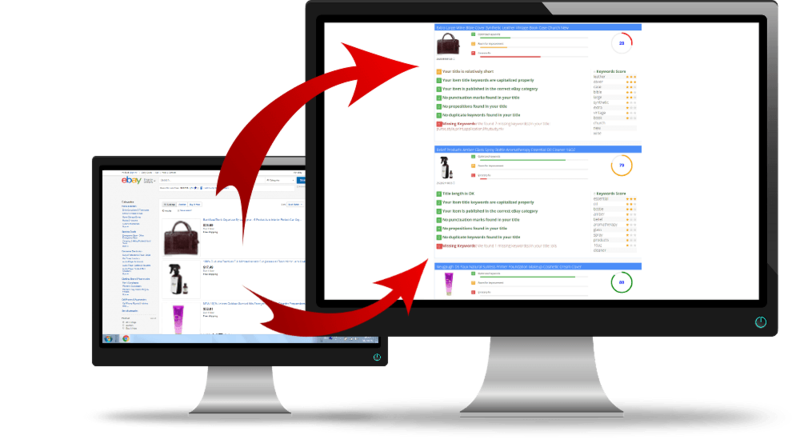 By following our suggestions above, you can dramatically improve your eBay item title and increase your average sales per day – simply by adding more keywords to your item title and removing the unnecessary keywords from it.